Just in time for the holidays, Carl “Sargon of Akkad” Benjamin has just had his Patreon account revoked. This comes along after a raft of high-profile de-platforming events of a number of prominent and almost entirely anti-social-justice campaigners. Milo Yiannopolous, Tommy Robinson, Gavin McInnes, Alex Jones, Lauren Southern and many others, removed from various social media and payment provision services. The trend is clear to any objective onlooker. The known left-wing bias of Silicon Valley has created an intellectual cartel, where social justice philosophy reigns supreme and anyone influential who poses a risk to their ideology can be removed. Patreon is an example that takes us to the bottom of a slipped slope, and portends the coming of great change. Patreon is not a social media platform. Unlike Twitter, Facebook and YouTube, that can often cite ‘creating a safe environment’ (whatever that means), Patreon users don’t directly interact with each other on the platform. It is not a forum of debate that needs to be filtered or curated, but a service that connects customers with content creators, offering subscription models that allow them to directly support their favourite creators. Like PayPal before them, Patreon provide a platform that simply serves to connect people who wish to transact. Just like PayPal, it has denied those connections in order to push a political agenda. When social media platforms create a biased forum, an argument can be made that it’s time to create a new forum; but the problem is much more insidious. When Patreon or PayPal begin removing customers, they are not just curating their own ecosystem; They are actively tearing apart a contract entered into by an individual and a content creator. They have shown contempt for the freedom of those individuals to transact. Not only does this illustrate the authoritarian streak of their company, but a complete ignorance to their role in facilitating exchanges based on customer demand. That the transaction has been prevented does not stop the demand from existing, it simply restricts the supply, which as any economist will tell you, drives UP the price until more supply is available. Like the banning of liquor in the 20’s only drove people to find new ways to supply and consume alcohol, so too will this prohibition of ideas create new markets for consumption. So their behaviour is counter-productive. Their actions are driving more content creators to create the very things that these platforms are seeking to dissuade. 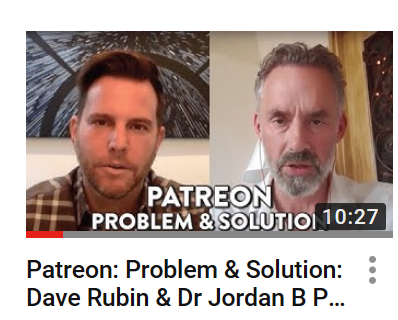 Jordan Peterson, arguably one of the most influential men on the planet right now, has been spurred to action. Illustrating exactly this point. Demand for anti-social-justice content creators is only getting larger. People are just waiting for a platform to exploit it. What we’re seeing is the approach to critical mass that will allow a new platform to truly compete with the left-wing cartel of Silicon Valley. Whether it’s Jordan Peterson, Elon Musk or anyone else; the market is ready for a new solution to facilitate open discussion. We are soon going to see an explosion of content that the mainstream social media sites, and the platforms that help fund them, have tried to supress. There will of course continue to be attempts at controlling the narrative, but ultimately, we are at a point where there can be only progress. The Silicon Valley cartel has played its hand and revealed its strategy. What’s left now is for us to remain resolute in our conviction to free speech and the marketplace of ideas, and to continue to support those creators who have been misrepresented and undermined. The internet is a place where all ideas can exist and compete. Attempts to control and curate it have been successful only in the short term, and like all cartels; the Cartel of Silicon valley will inevitably fall.